Blast your way through the streets of Hong Kong in a fast-paced, top-down shooter. Inspired by classic action movies, The Hong Kong Massacre places you at the centre of a hard-boiled revenge story, filled with brutal, cinematic shootouts and vivid underworld locations. Take on the role of a former police detective bent on exacting vengeance for his partner's murder and use of a mixture of raw firepower, slow-motion and dive/dodge mechanics to tear your way through the criminal ranks. Dive through windows or dodge behind cover - every shot is lethal, so stay aware of your surroundings and exploit the environment however you can. When the heat is on, you can slow down time and plan for the next move. 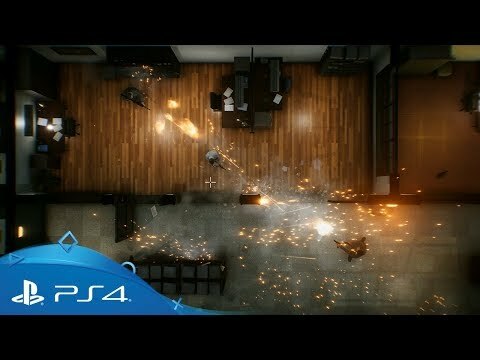 Avoiding bullets whilst taking out enemies is crucial for survival - but beware, your slow-motion ability is limited: plan fast, think ahead and bring down the bad guys unscathed. Each level features a range of challenges, allowing you to to unlock new weapons as you progress, trading bullets from restaurants to rooftops across a moody, crime-riddled city.